DWI defense is a touchy matter that’s best left in the hands of a knowledgeable and capable defense lawyer. Tad Nelson, a respected Houston defense lawyer for DWI cases, has consistently explained the need for specialized legal counsel when fighting back against allegations of drunk driving or other criminal offense which involve evidence of a chemical or scientific nature. The main reason for specialized legal counsel in Harris County DWI trials is because the very nature of the offense relies on biochemical evidence which must prove the defendant was intoxicated beyond a reasonable doubt in order for the prosecutor to gain a conviction from the court of law. Most folks who are arrested for drunk driving in Texas often accept a plea-deal with prosecutors to get the matter over with only to find out later about the gravity of the mistake they’ve made. The main reason why it makes sense to fight criminal charges related to “driving while intoxicated” is for a number of reasons starting with the future. With a criminal conviction on your background, and yes you’ll have a criminal conviction if you agree to any deals with the state, it’ll make life more difficult that it already is. For starters, you’ll have a criminal background and if you’re ever arrested for a drunk driving offense again in the future you’ll face much stiffer charges up to a felony which could land you in prison. Considering the above-stated, if you’re facing even a first offense drunk driving offense, it’s worth seeking an attorney to help you fight the charge rather than making the convenient plea bargain which will hurt your future. This includes probationary deals and agreements to pay a small fine to make it go away. The best advice; talk with a criminal defense lawyer and decide what’s best for your future. 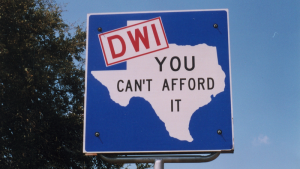 Also, if you’re convicted of a DWI offense in the state of Texas on any level, you’ll lose your Texas Driver License for a period of up to two years which can make life a living hell. If you live in the Houston area, then you know that survival is nearly impossible for persons who lack personal transportation. Considering the filth on Metro’s public transportation options, losing your Texas Driver License can cause problems and inconveniences in more than a few ways. Don’t accept less than the most experienced legal representation when your life is on the line in a Texas criminal case. Hire a smart defense lawyer that has experience defending people accused of crimes that could be considered similar to yours. Although some lawyers are excellent and win on a normal basis, they may not be best for a DWI case when their skillset is tailored towards other areas of the law. It goes without saying the we recommend Attorney Tad A. Nelson for persons in need of legal representation for serious felony DWI cases. Even if you don’t hire the lawyer we recommend, an equally qualified Texas criminal law should suffice.